For thousands of years local people had a great affinity with the land, living sustainably with their environment. Traditionally, a villager had to ask permission from his Chief or Village Headman before he could utilise anything from their environment. For wood, he would ask which branch of a tree could be cut for firewood or for building materials, leaving the rest of the tree intact, to re-grow and be utilised again. Many villages had special days of the year in which they could hunt or fish, again only with permission from their local elders. These traditions were passed down orally from generation to generation and enabled the rural populations to live in harmony with the land. With onset of the mines in the 1920s there was a greater demand for wood and a need to feed a growing workforce. This put a huge strain on both forests and wildlife. And when diseases, such as HIV, swept through the Country, many of the elders died, and with them, their traditional knowledge. The old ways of how to live sustainably, respecting their environment, were lost. The Country’s population growth over the last 50 years, from 3.7 million to over 16 million people, has put huge pressure on its natural resources. Almost 60% of the population live in rural areas and many of them depend on income from the land and waters that surround them. There is also a great demand from urban populations for charcoal and food. As the population rises it is putting greater pressure on land use and the local flora and fauna. Due to the need for increased agriculture, to feed an ever growing population, habits are being destroyed. The Game Management Areas where wildlife live outside the National Parks, are becoming more populated and so there are more human/wildlife conflicts: crop raiding by elephants; threats to cattle and livestock by big cats; and threats to people who are just trying to protect their small-scale farms. People cannot easily move to another area – and can you imagine how emotionally and financially devastating it must be to have your whole season’s vegetable crop being wiped out in just night by a herd of hungry elephants? Forests cover about 51 %, or about 42,452,000 hectares, of the Country. Trees have always been in great demand – charcoal for cooking, as building materials and for export. Large tracts of forest are being cut down for the expansion of small scale and commercial agriculture. As nearly 75% of the population does not have access to electricity, charcoal and wood is their main source of light, warmth and energy. And with urban populations lacking reliable electricity sources, the demand for charcoal and wood is increasing. Zambia is one of the most forested countries in the world, but it is now also one of the top greenhouse gas-emitting countries in the world. It has one of the highest rates of deforestation – estimations report that between 250,000 to 300,000 hectares of woodland is being cut down every year. Locally, rural populations depend on forests, not only for wood, but also for non-timber products. They harvest honey, mushrooms, fruits and insects. Bark, leaves, and roots are also harvested for traditional medicines. Our forests provide habitats for much of our diverse wildlife species, they offer watershed protection, prevent soil erosion, and help in maintaining healthy water cycles. Globally, our forests are important as they cut greenhouse gas emissions. They are key to the world’s global carbon cycle, keeping global warming in check by using carbon dioxide in photosynthesis. As trees grow they absorb carbon, storing it and then emitting it as they age or are cut down. Forest degradation and deforestation are the largest single source of carbon emissions. In June 2017 Zambia banned the export of timber to try and slow down the rate of deforestation. It had been found that both large and small scale commercial logging operations had been over-harvesting our forests at an alarming rate. This followed the ban of exporting rare and much sought after Mukula trees (Pterocarpus chrysothrix) in February. Mukula are slow growing and take 90 years to mature. They are widespread, growing the mountainous regions of the Copperbelt, North Western and Western Provinces. These rare trees are prized for their rosewood, which is made into furniture, high class joinery and is used for traditional medicines. The wood is in high demand from overseas markets and it was found that foreigners had been exploiting local villagers, paying just $5 for a tree, and then illegally exporting it. The indiscriminate chopping down of Mukula trees for export now means that it is on the verge of extinction. Game meat is very sort after, especially by wealthy urban dwellers, with game farms only being able to supply a fraction of the demand. It is now more expensive than beef and so illegal bush meat is therefore in great demand. Although poaching is a rural problem, often done by local people, most of the illegal bush meat is transported to the towns and sold commercially where it fetches higher prices. 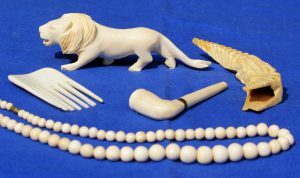 There is also an international demand for illegal wildlife products – elephant ivory, lion bones, pangolin scales, wildlife skins and parrots – which are illegally taken from the wild and then exported – this illegal business in now a worldwide problem. The growing demand is putting greater pressure on our wildlife in our National Parks, protected areas, and even on private game farms, where thousands of animals are poached every year. Snaring, hunting with dogs and firearms are the most common methods used by poachers, as well as the use of fire. This demand is not sustainable and the challenges for the DNPW are immense. Zambia has 15 million hectares of water in the form of rivers, lakes and swamps and it is estimated that 300,000 people derive their livelihood from the fishing industry, many in the rural areas. Fish has always been an important source of protein and Zambia has about 400 species and sub-species of fish with more than 50% of them found in Lake Tanganyika. 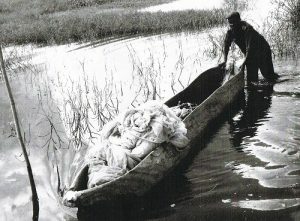 Traditional fishing methods have including using nets, both fixed and dragnets; building fences and weirs across the rivers, with cone-shaped traps made out of reeds trapping the larger fish; and spear fishing. When Kafue National Park was gazetted, the traditional rights were reserved allowing the local fisherman to create weirs in the Busanga floodplains and to fish for six weeks every year. They still use the same rituals today of weaving their fishing baskets from reeds collected from the Kafue River and the village elders prepare special medicines which are sprinkled on the ground to keep them safe from crocodiles and dangerous animals whilst they fish. If they find a crocodile they will tie it up to a tree and then release it back into the waters when they have finished their fishing. In the south of the Park, spear fishing is permitted in pools traditional owned by the Village Headmen for the Subjects of Chief Shezongo. When water levels are low in October groups of fishermen stir up the waters to make it murky and then spear the fish – mainly Barbel (Clarias mossambicus) which are then taken back to their villages. The modern method for fishing is set out in the Fisheries Act 2012. Fishing is by licence only and you are no longer allowed to use trawl or bottom drag nets; cannot set any net across a river; or lagoon or alter the natural terrain. The mesh size of nets are set out in the Act for each Region – in the Bangweulu Commercial Fishing area, the draw net of mesh size is 800 mm with the gill net mesh size no less than 63 mm. In Kariba’s Commercial Fishing Area gill nets have to be larger than 76 mm with Kapenta nets no less than 10 mm. These sizes have been set so that only larger fish are caught, having given the fish to have bred at least once during their lifespan. In many areas fishing is banned from the 1st December until the beginning of March the following year. This ban is to protect the fish during their breeding season so the waters are restocked. No commercial fishing is allowed in the National Parks. Tourists can only fish by licence. Sadly many of the fishing regulations are ignored, with fishermen using poison, fish without licences or they are using small-mesh mosquito nets which are fast depleting the fish stocks in our rivers and lakes. 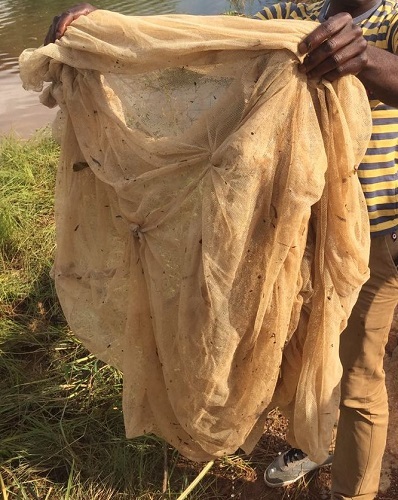 The illegal use of mosquito nets, which have given out freely by well-meaning health NGOs to stop malaria, are instead being used for fishing across the country. Homemade nets, stitched together from shade cloth and mosquito nets can be over 100 m long. As these illegal nets have a tiny mesh size they sweep up all the fish, removing the fingerlings before they can grow and then breed to replenish fish populations. New mosquito nets are impregnated with chemicals, which leach out, poisoning the waters. And often these illegal nets are left in our rivers and lakes, so that when the waters recede after the rainy season, birds, small mammals and other creatures that live in the water get caught up in them, and die. The Copperbelt HWPO Unit found a dead crocodile in the Kafue River. It had become caught up in these illegal nets and drowned. Although not everyone likes crocodiles, they do play an important role in our rivers ecosystem. They keep rivers clean by eating carcasses of other species and by keep populations of predatory fish in check – if predatory fish numbers grow too large, they then eat other smaller fish species, often to extinction in that section of water. A river’s ecosystem can be thrown off balance with every species that depend on the aquatic food chain being affected – for example fish eating birds would then have no food, and the fishermen would have no fish to legally catch. 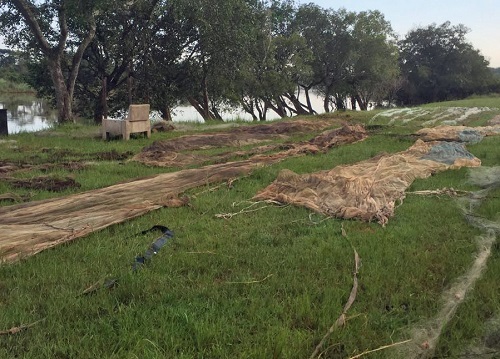 On just one operation the Unit confiscated over 4 tonnes of illegal fishing nets found in the upper Kafue River. The Lusaka HWPO Unit also found illegal fishing nets being used on Lake Itezi-Tezi. They confiscated not only mosquito nets, but nets with mesh sizes of only 2.5cm. Along the edge of the lake they also came across abandoned nets tangled up in the trees. 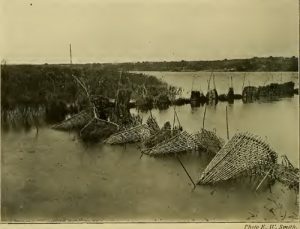 These had been exposed when the waters had receded and had trapped and killed roosting birds and small animals. 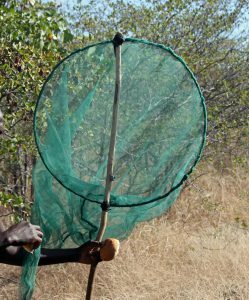 Although mosquito nets do help in the prevention malaria, sadly the organisations who freely give them out to rural populations do not always monitor their use or always think about the long-term ecological harm these free nets are causing. Fish are a traditional part of the diet, but over-fishing using illegal homemade nets is depleting our rivers and lakes of their natural resources. Not only depleting fish stocks, but also killing our birds and wildlife. Our natural resources are not infinite. Over half our population live in rural areas and many are subsistence farmers, who make a living from their local environment. With the loss of many traditional practices of how to live sustainably within their natural environment, a growing population and a greater demand from foreign markets, our forests, along with their non-timber products and our birds, fish and wildlife are rapidly becoming depleted. There needs to be a change in attitudes towards our bio-diversity, with a better understanding of our long-term environmental problems.